The LionSteel Mini Gentleman's folding knife with Damasteel blade and olive wood handle is an elegant working knife, ready for a pair of jeans at the job site or in slacks at a board meeting. 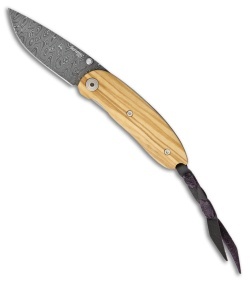 Made with attractive Damasteel, the Mini takes and holds a fantastic edge while having a striking blade pattern. Beautiful olive wood handles have a deep, rich grain structure and fit snugly in the hand. Easily carry the Mini with the right hand, tip-down pocket clip.